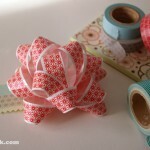 Super-Junk is the craft blog of Melissa: teacher, collector, amateur photographer and weekend seamstress. 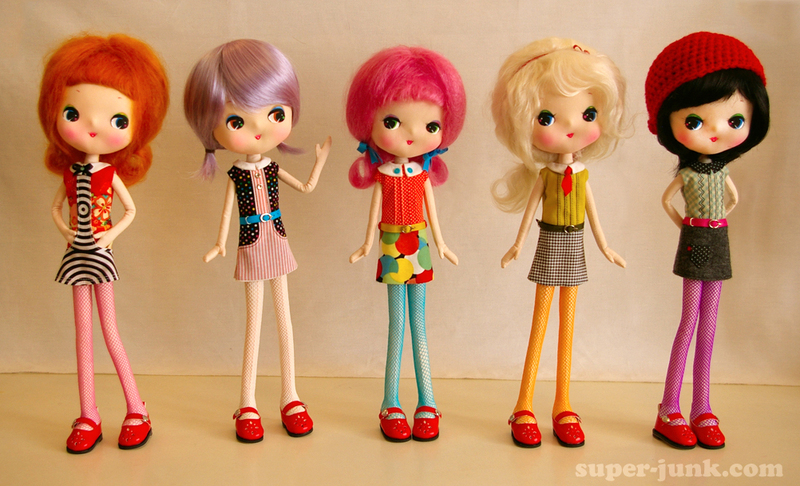 In one week, I’ll be offering four of these handmade pose dolls for sale (one has already found a home). I wanted to provide information in advance so everyone gets a chance to know them before thinking about buying. 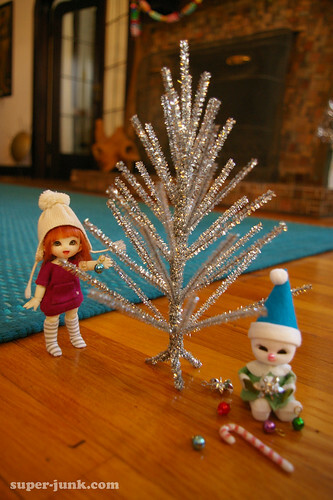 Soft doll – fully pose-able and stands unassisted. 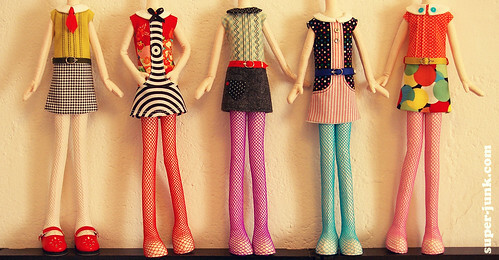 dress size: 1/6 scale dresses, skirts and tops (due to shoe size, she can not wear pants) . 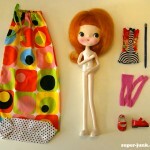 She can share clothes with Blythe, Licca, WTG, Azone, Skipper, etc. Head: Polyester fabric, resin and foam. Hand-painted faces so no two will ever be alike. 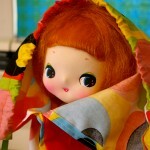 This is an edition of 5 handmade dolls. 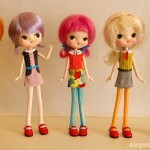 I will not reproduce the same doll twice. Not intended for children under 13! 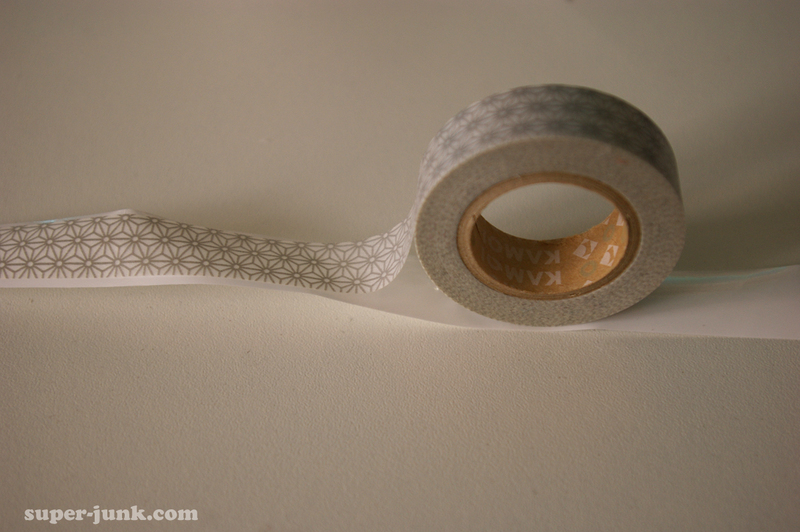 Japanese paper tape has been a popular crafting supply in the past couple of years. 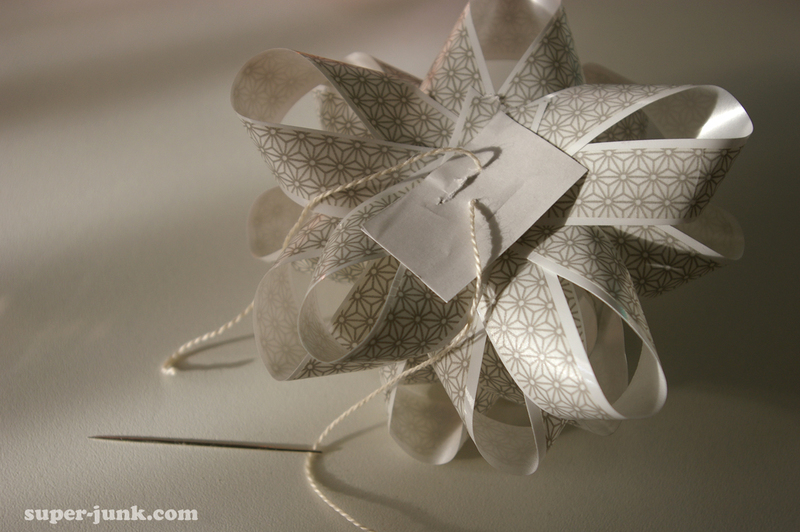 I bought a bunch in Japan and never really know what to do with it since I don’t do much paper crafting, but when I do find a way to work with it I fall in love with how versatile it is! 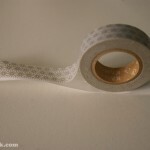 It’s got a great smooth translucent finish to it and is easy to reposition without damaging other surfaces. 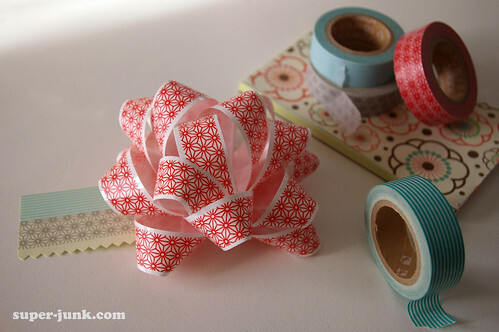 After flipping through one of Martha’s christmas magazines, I was inspired to make some Washi Tape gift tags, and decided to try to make matching bows since plain drugstore bows are pretty boring on their own. 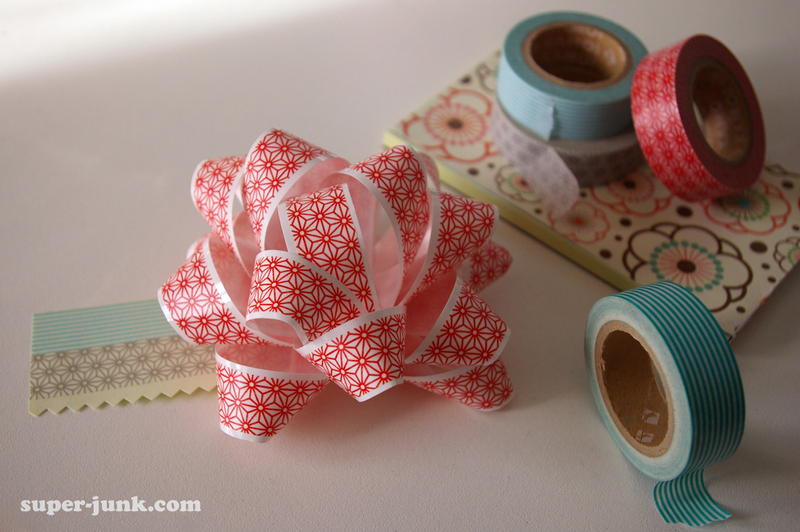 It’s actually quite easy and elevates the look of the cheapie bow with the nice texture of the Japanese tape, plus it’s easy to coordinate with gift tags and cards. 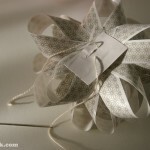 I found it looks best on a light or white bow. thread a sharp needle with embroidery or craft floss. 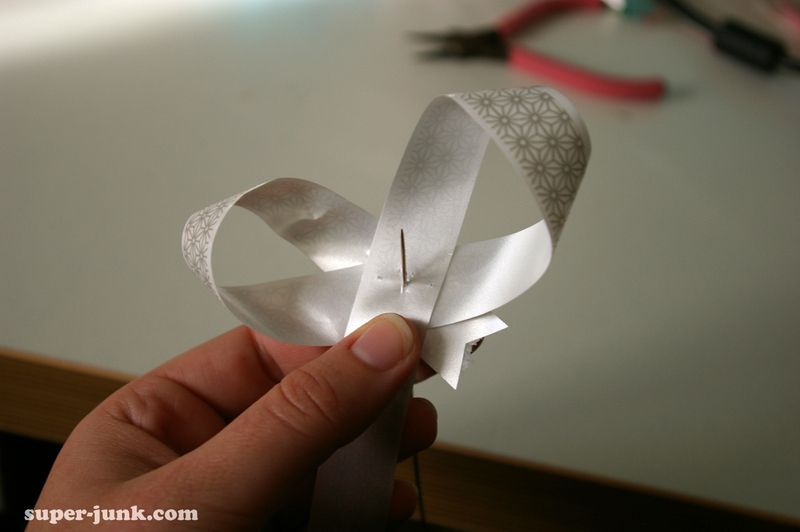 using the staple-holes as a guide, re-build the bow starting with the sticky paper tab. 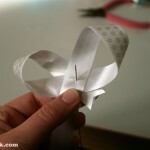 This part is easy because the bow will have some “memory”. 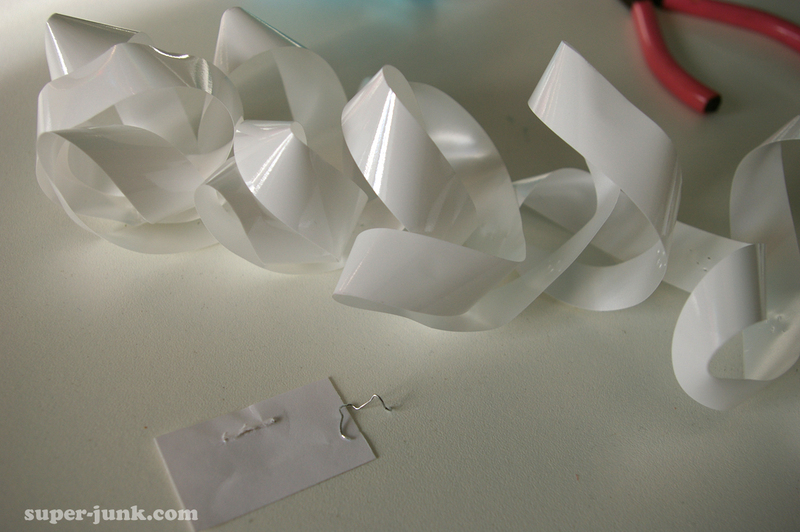 when the last loop is threaded, send the needle back down through the bow (wiggle it around and use a thimble, it will be hard to get through all the tape at once. 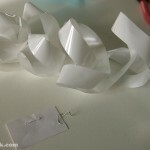 Tie in a knot and cut off the ends. Trick or Treat! With only a week left until Halloween, It’s almost time to start carving up some jack-o-lanterns. 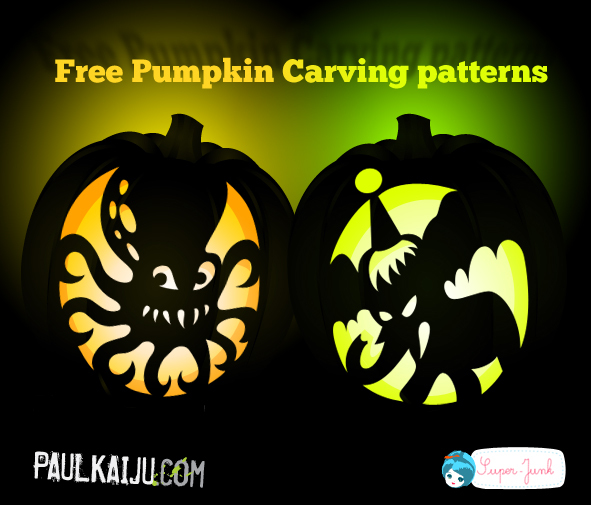 Paul and I will be designing new patterns for our pumpkins this year, but are happy to share our patterns from Halloweens past. The Octopus and Evil Circus Elephant were drawn by hand by Paul and turned into printable patterns by me. Check ’em out and pass them on! Here’s a how-to on the best pumpkin carving technique. Enjoy! Hope everyone found lots of eggs! 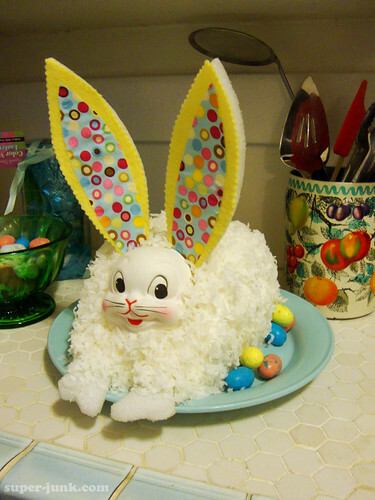 This is my first bunny cake. Welcome to the world, overweight angora rabbit with Styro-feet™. He’s stuffed with crushed pineapple and more coconut. yum! I confess, I don’t spend much time cooking. I do, however, want it to be functional and nice so my cook doesn’t quit. 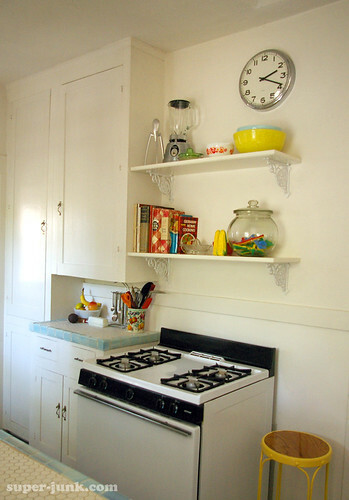 Our kitchen is a smallish galley with a little breakfast nook – lots of wall space but only one upper wall cabinet – definitely not taking advantage of the height. 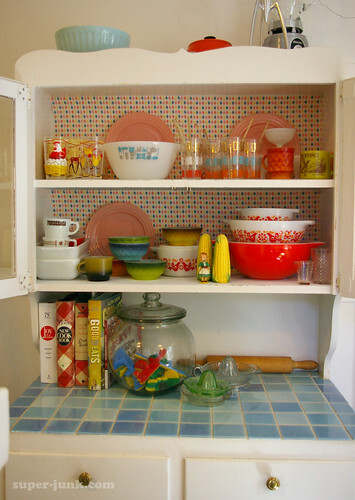 I knew I wanted to put in open shelving to hold our cookbooks and some of my more colorful pyrex since the room is pretty stark white. 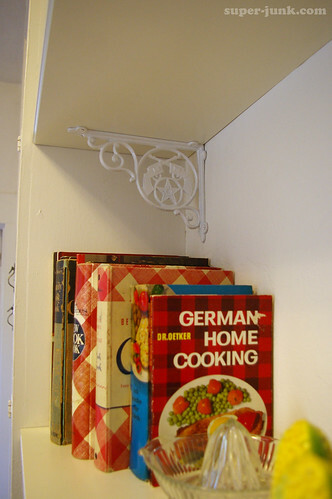 I was shopping around for vintage corbels on ebay when I stumbled across these reproduction crossed-gun brackets. I think they’re a nice crossover between my love of kitchen knick-knacks and kitchy cowpokes (a collection I seriously want to expand!). I just sprayed them white. We cut down two pre-milled laminated shelves from Ikea. They’re strong and heat resistant. 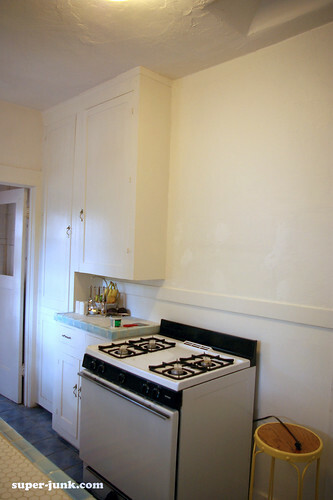 I am searching now for the perfect fabric for curtains to help with the stark whiteness. I’d also love to paint above the chair rail. Maybe use up the robin’s egg blue I have left over from the last place. The last 3 months (wow, has it been that long?) for me have been pretty consumed with work and moving to a new house. 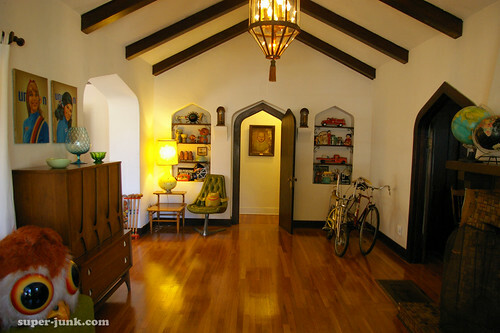 The house is finally feeling like “ours” and so I was itching to take some pics and talk about how 2010 has been going. I’m so sorry, we had a plumbing emergency today and I completely lost track of time and didn’t get the babies in my shop on time. I knew I should have set an alarm! 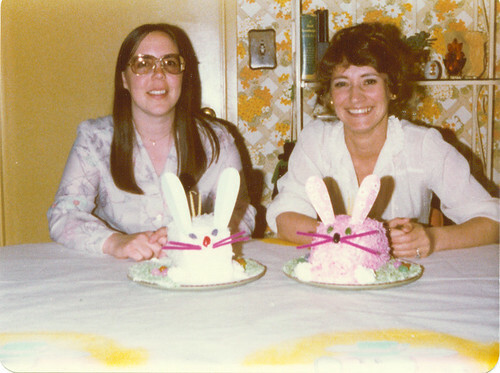 I’ll post The two bunka babies tomorrow (Sunday, March 14) at noon PST. To punish myself I will work on a new batch right away! 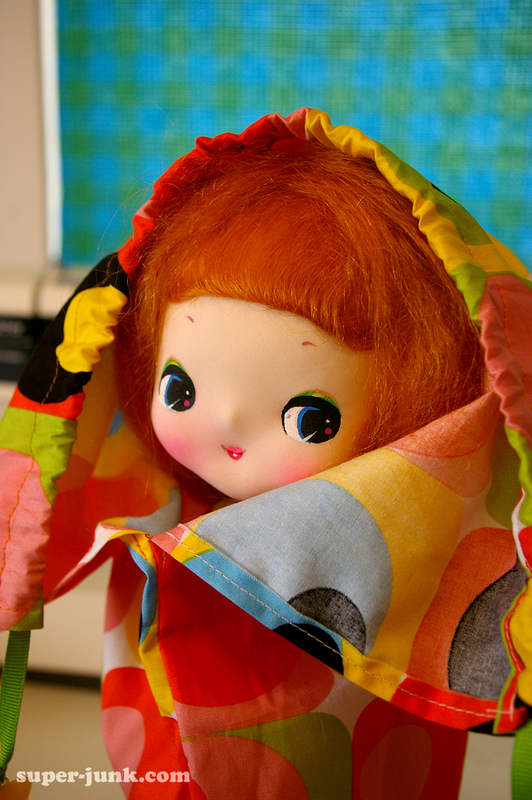 Two Bunka babies will be posted for sale in my Etsy – Saturday, March 13 at noon PST!